AOMEI Partition Assistant Standard Edition's user interface is similar to other partition managers, with a list of tasks displayed on the left side while drives and partitions are displayed on the right. We selected the partition or drive we wanted to work on and then applied the relevant action by selecting it on the task list. The free partition manager offered us several wizards to help us perform different functions. The wizards make it easy for almost any computer user to create or change partitions without affecting important data. However, the language was rather problematic, at least for the English version. We had a lot of flexibility in modifying the partitions on our computer. For example, we could split partitions, merge two or more partitions to make a larger one or even add unallocated space to a partition. We could also make exact copies of partitions whose content we wanted to move or copy to a different hard drive. We manipulated our partitions and shrank some to create more space for the one we wanted to hold more content. The wizards helped us perform different functions, including migrating our operating system to an SSD. One of the most interesting features is the ability to create a bootable disk that you can use on other computers, thanks to the Windows To Go feature. You can use different types of external storage media, including USB flash drives. We created a live version of Windows 8 from a Windows Install Media ISO file. Please note that you will still have to activate your copy of Windows. 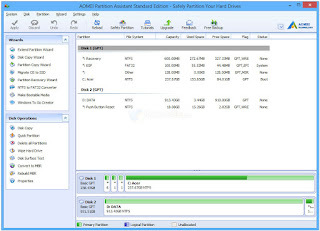 AOMEI Partition Assistant Standard Edition has great partitioning capabilities. The free partition manager offers adequate functions for many users. You can even use it to create live Windows disk to use on multiple computers.